With the NBA season upon us once again, it is time to make early predictions on how the season is going to turn out. Instead of simply picking who I think is going to make the playoffs and win it all, I thought I’d share my thoughts on not only who is going to win, but who is going to surprise us, and who is going to fall flat on their face. And let’s not forget highlighting the top rookies and players of the league. So without further ado, I present another round of Percy’s Predictions! To organize this all pretty-like, I’m going to take things conference by conference. No explanation is really needed for why the Warriors are, once again, going to be the Winners of the West. Any team with Steph Curry, Kevin Durant, Klay Thompson, and Draymond Green is going to be a lock to win their conference (and most likely the championship). Barring any serious injuries to the four players stated above, there is very little chance of the Warriors not winning the West. However, I will not say they are invincible. Despite their star power, depth, and chemistry, I think the Warriors are still beatable, but only by two teams: The Spurs and the Rockets. The Spurs and the Rockets are the only two teams that stand a chance against the Warriors in a 7-game series due to their depth, leadership, and play styles. Both teams have improved this offseason (especially the Rockets) and are both seeking to take down the beast. The Thunder have improved as well, but their bench is not much compared to the other three teams and I am weary of how three stars who need the ball in their hands will go over. I could easily see problems arising down the line. But if they can figure it out, then who knows? All in all, the Warriors will finish first in the conference, however they will not win 70 games like some are predicting. They will suffer losses to the other powerhouses of the league, and their annual loss to the Lakers will prevent them from reaching the 70 win mark. I use the term ‘Losers’ a bit loosely in this scenario. Yes, the Suns will most likely be the worst team in the West this year, but it will be nothing compared to the dumpster fire at the bottom of the East. With players like Eric Bledsoe, Devin Booker, and Tyson Chandler returning, they will have some talent and experience to lead the team. They’re a young team with potential, with guys like Dragan Bender, Marquese Chris, Tyler Ulis and others filling out their roster. By the way, I firmly believe Tyler Ulis has the potential to become an Isaiah Thomas-esque player and will eventually reach that status. His play at Kentucky impressed me from the first time I watched him. He has shown development since his freshman year and I fully believe will become a solid starter at some point in his career. Also worth mentioning is the addition of 4th overall pick in the 2017 draft, Josh Jackson. Phoenix will be a fun team to watch. They will lose and get pummeled, but will be fun to watch nonetheless and will develop as the season goes on. They will especially lose if they decide to deal Eric Bledsoe for draft picks like some are predicting and theorizing. But Phoenix has a bright future ahead, no matter what direction they choose to go in. Pretty much everyone knows The Minnesota Timberwolves have improved greatly with their acquisition of Jimmy Butler. But the acquisition of Jimmy Butler was not the only good move of the offseason for Minnesota. Minnesota also added veteran talent to their lineup by the likes of Jeff Teague, a solid point-guard, Jamal Crawford, a useful veteran shooter, and Taj Gibson, a solid body in the front court that adds depth to their team. But that’s not all. This past week, they signed Andrew Wiggins to a max extension, keeping the talented young stud in Minnesota for five more years. Their upcoming season is now filled with hype and expectations of great improvement, and I, like the others, expect great things from them. I expect this team to make the playoffs this year with their improvement, however I see the Timberwolves doing more than that. I believe that Jimmy Butler will have a larger impact on the team than people realize. And in the same vein, so will Jamal Crawford. Before these two guys got to Minnesota, the team lacked true shooting, especially from 3-pt range. Zach LaVine and Andrew Wiggins were solid shooters, but LaVine is gone and Wiggins relies on driving to the hoop for scoring. Butler and Crawford will provide firepower from beyond the arc that will help stretch the floor, which will also help a fastly improving Karl Anthony-Towns who is bound to go on a tear this year and become a top ten player. Yes De’Aaron Fox. Most people predict Lonzo Ball will be the best rookie in the entire class, but I don’t think he’ll even be the best rookie in his own conference. Going back to last year, I was more impressed by De’Aaron’s talent as opposed to Lonzo. Yes Lonzo is a great prospect with all the potential in the world, but I do not feel he has the explosiveness and drive to reach that next level. Ball will probably start the season off really hot, play well on national T.V., but then trail off and plateau as the season goes on. Lonzo has a lot of pressure being in L.A. and having LaVar as his father. If he slips up, everyone will be on him in a heartbeat. And not to mention a lot of players are going to be gunning to punish him and shut him down for all the hype surrounding him. De’Aaron, meanwhile, has no pressure at all on him. He’s in Sacramento where no one will be paying attention, his team isn’t expected to go anywhere. He’s got all the time in the world to develop and work on his game. De’Aaron will probably start off rough, but only get better as the season goes on. He’ll get used to the system, he’ll get used to the physicality, and he’ll improve his shooting. De’Aaron will develop into a solid player and consistently put up solid numbers night in and night out over the course of the season. Lonzo will make some headlines every now and then, but De’Aaron will have the consistency. Golden State may have four of the best players in the West, but Kawhi Leonard will be number one. Kawhi Leonard is one of the most well-rounded, versatile players in the league and works phenomenally in Pop’s system. He’s a star player with his own team. Kawhi doesn’t have to worry about other star players getting touches and shots like the Warriors, Rockets, or Thunder do. Kawhi is able to control the game and be whatever type of player his team needs at the moment. He can facilitate the ball and spread the floor, he can keep the ball and shoot the lights out of the place, or he can step back and shut down the opposing offense. Kawhi is as far from one-dimensional as you can get, allowing him to have great games every night even if his shot isn’t falling. I believe the best and most valuable player to a team is one who doesn’t have to rely on shooting to help his team win games. Again, no surprise here. The Cavaliers are going to be the top team in the East and there’s really no one who can stop them. And mind you, this is even after losing a star player like Kyrie. To be perfectly honest, I think it’s very possible that this team is even better than they were last year. Yeah they lost Kyrie, but because of that, they gained Isaiah Thomas, Jae Crowder, Ante Zizic, and the Brooklyn pick, which is going to be very valuable to Cleveland because they’re going to gain promising young talent while maintaining their success. And although Isaiah is hurt right now, he’s going to be back around midway through the season with a chip larger than the sun on his shoulder. He’s going to play his heart out and absolutely tear it up. But until then, the Cavs are still going to be phenomenal. LeBron will be LeBron. Dwyane Wade will provide some solid shooting, along with JR Smith. Kevin Love will continue to be an underrated third option, and Jae Crowder will provide solid production on the offensive end, while being very tough and intimidating on the other end. But hhe player who I think will have the largest, under-the-radar impact on the Cavs is Derrick Rose and I believe he is more important than most realize. If Derrick Rose is able to play solid, fearless basketball, then he will be a great asset to the Cavs. Rose does not have to return to his MVP form, and I feel he realizes that, which takes a load of pressure off of him. Derrick Rose seems to have adapted to becoming a role player, which will help him become more useful to a team that does not need an MVP with LeBron there. Rose has shown intensity and explosiveness that was really lacking from his game when he was with the Knicks. Rose seems to want to be there and make a difference and I have full confidence that he will be a great starter while Thomas is out and then become a dangerous player coming off the bench going up against the 2nd string guard of the opposing team. To understand this pick, all you need to see are images from the Bull’s media day. They had guys in strollers, guys you’ve never seen before, and guys without last names. The Bulls are a mess and have hardly made any improvements to their roster. The only “gains” they really made were adding Zach LaVine and Kris Dunn. But those acquisitions will only be viewed as solid if a few certain factors come to fruition. The success of this trade and the improvement of the team relies largely on if Zach LaVine is able to come back and perform at the level he was at prior to his torn ACL and if Kris Dunn lives up to his expectations. Now there’s still time for both of these players to become who they were projected to be, but it won’t necessarily happen this year. And even if it did, they wouldn’t be nearly enough to help the Bulls climb out of that dumpster fire. Their roster is one of the weakest I’ve seen in recent memory. Up there with the 2015-2016 Sixers. But at least the Sixers had promise. 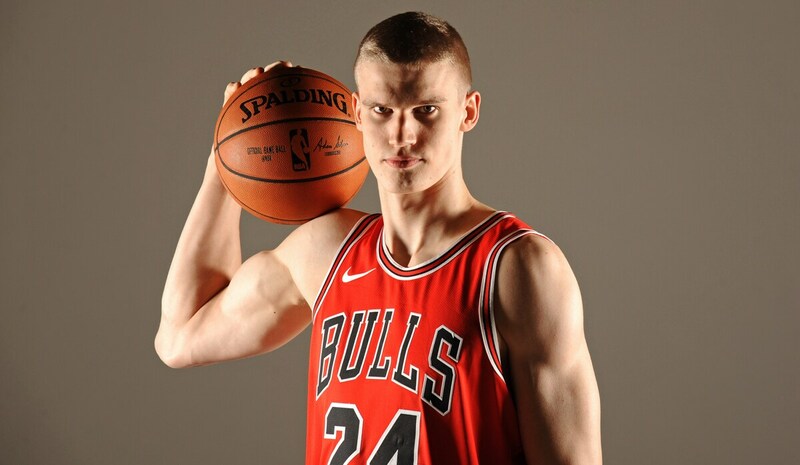 I find it hard to find many positives about the 2017-2018 Bulls outside of LaVine, Dunn, and their future top pick. Hell, they even lost Mirotic due to Bobby Portis punching him in the face, which is a black-eye (pun intended) on the organization as it is, but also reflects potentially poor chemistry amongst the entire team. If you’re a Bulls fan, there is not much for you to look forward to this year. Also, quick reminder, GarPax essentially turned Gary Harris, Jusuf Nurkic, Doug McDermott, Taj Gibson, and a 2nd rounder into Cameron Payne. So as you can see, the Bulls at least have great leadership steering them in the right direction and not into an even larger dumpster fire! I almost picked Miami for this one, but decided against it at the last moment. It honestly could go either way. Miami showed a lot of growth last year and nearly made the playoffs with their insane run. They’ve got players like Waiters and Whiteside that could really make a difference in a game and along with the rest of the Miami roster, have a team that could potentially play spoiler in the playoffs. The reason I chose the Sixers over the Heat for the choice of sleeper is because I feel the Sixers’ roster as a unit has more potential to be great this season. They’ve got young studs like Simmons and Fultz. They’ve got great role players like Covington and Saric. They’ve got the veteran presence in Reddick, Johnson, and Bayless. And, they’ve got the face in Embiid. This team has all the potential in the world to be a great team down the road, but I believe they have the ability to be effective right now. I feel that the Sixers have the potential to play ahead of schedule much like the New York Yankees have this year. Better outside scoring will benefit the team, making them more well-rounded. Veteran presence will help guide and teach the younger players. And a (hopefully) full season from Embiid will give the team a huge boost all-around. The only problem with this team, but is also a bit of a plus is that they’re so young. It’s good in the sense that they have great potential down the road, but it’s a problem when looking at the success of the team this year. Since the Sixers are made up of mainly young guys, they don’t have the experience yet and still have much to learn. Not to mention not being at their prime like the superstars of the league they’d be going up against. They may be able to surprise people and develop ahead of schedule, they may not. The Sixers’ entire season is made up of what-ifs, and that may prove to be the deciding factor of the Sixers’ success this season. With their star players having histories with injuries, their seasons rest in the hands of the basketball gods. If they all can stay healthy, then the Sixers will see great success. I think a lot of people have forgotten that Ben Simmons is a rookie this year. Everyone has been so caught up with this year’s rookie class, especially with Lonzo Ball. Why I’ve chosen Simmons over his other highly touted teammate, Markelle Fultz, is because I feel Ben Simmons is a better athlete and all-around player than Fultz. Also, Markelle is the type of player who will need a few years to fully develop and get used to things. Fultz is a great shooter and passer no doubt, but Simmons is simply a freak of nature. Simmons is the size of a power forward, but has the skill set of a point guard. He’s able to handle the ball, dish the ball, shoot the ball, and defend the ball. It was merely two years ago, but I feel many have forgotten just how good Ben Simmons was at LSU. He could seriously do it all. And not only can he do it all, but he can guard them all, which I believe is a very underrated asset for a player to have in this league. Now combine all of this with a year’s worth of NBA knowledge that Simmons has absorbed from being out for the season last year, but still being around the game. Simmons already has a leg up on all these rookies in that regard, making him a force to be reckoned with. Without reiterating myself too much, I chose Ben Simmons over De’Aaron Fox and the rest of the rookies because I believe Ben Simmons is the best athlete and the best talent of this rookie class. Simmons also has a better supporting cast to help him play even better and help him win games. I believe a Simmons playing at the level I expect him to plus his team winning will ultimately lead the voters to choose him over any other rookie. Again do not want to repeat myself too much here, but LeBron is going to be a player that impacts his team the most this season due to what he’s playing for. LeBron will want to show this league that a loss will not set him back, but only make him stronger. LeBron is out to prove and remind everyone that he is the best player in the league and there is no one that can touch him. So there are my predictions. Look forward to seeing how wrong I am in the end. Here’s to a great season of basketball!